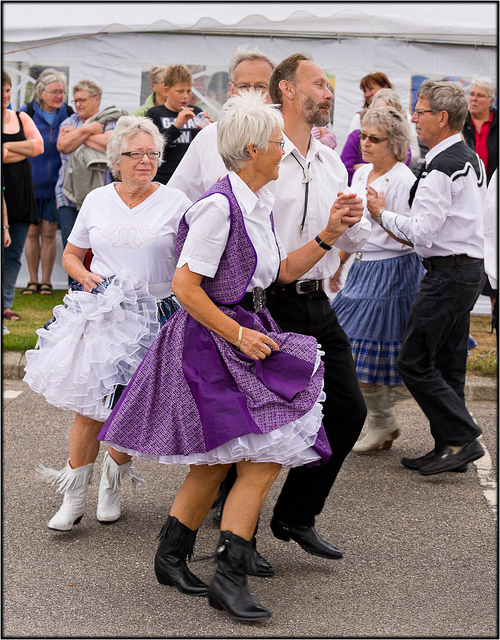 Square dancers; photo by Poul-Werner Dam on Flickr (use permitted with attribution). Every region has folk customs, they give people a special sense of identity and belonging to a group. The square dance provided pioneers with recreation and social contact with neighbors - and it's still doing that today! Twenty-four states have officially adopted the square dance as a state symbol, and more than thirty bills have been introduced at the federal level (beginning in 1965) proposing the square dance as the national [folk] dance of the United States. From "An American Folk Custom" by Richard M. MacKinnon; "In The Complete Book of Square Dancing, Betty Casey writes: The square dance is uniquely American. The format, many of the folk dances movements, and the terminology incorporated into the square dance were brought by early emigrants from other countries to the United States. Borrowed bits from foreign dances such as French quadrilles, Irish jigs, English reels, and Spanish fandangos have blended with American folkways and customs into the square dance. The vague, anonymous and rural origins of American square dancing were first explored in Lloyd Shaw's Cowboy Dances, written in 1939; Had these Western dances been the dances of scholars, every variant would have been recorded and fully annotated. Chronologies and pedigrees and records would have been kept. But these were the dances of country folk, who kept all their essential knowledge written only on the uncertain pages of memory! They were the dances of laconic folk who didn't tell all they knew even under questioning! They were often the dances of secretive folk who were somewhat jealous of their special talent and special knowledge. ... So all we have to go by in our speculations is the internal evidence presented by the dances themselves."